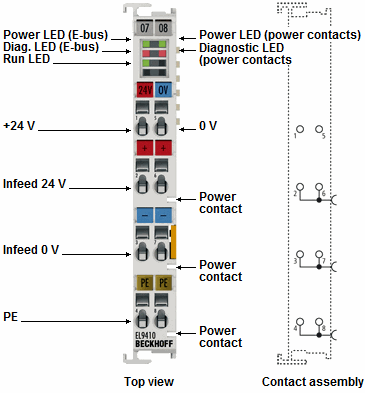 The EL9400 and EL9410 power supply terminals are used to refresh the E-bus. Data is exchanged between the coupler and the EtherCAT Terminal over the E-bus. Each terminal draws a certain amount of current from the E-bus (see “current consumption E-bus” in the technical data). This current is fed into the E-bus by the relevant coupler’s power supply unit. 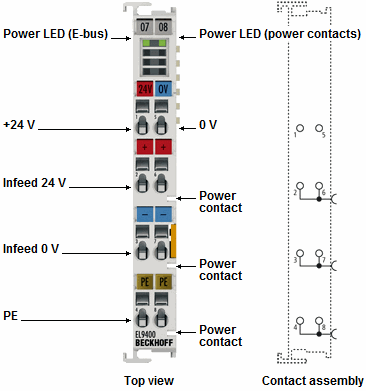 In configurations with a large number of terminals it is possible to use the EL9400/EL9410 in order to supply an extra 2 A to the E-bus. As opposed to the EL9400, the EL9410 has a diagnostic function which is displayed by LED and on the process image.